Now the cleaning properties of a premium detergent are available at a low price. “GOLDEN-SUDS” is designed primarily as a low price per gallon dish wash detergent for medium to low soil loads… not recommended for heavy grease loads. It makes a good all around detergent for light duty dishwashing… it meets the certain type buyer who is more concerned about price per gallon than overall economy that can be gotten from higher quality product. 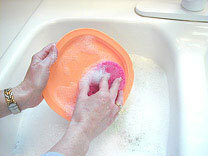 “GOLDEN-SUDS” can be used in most water hardness conditions, although harder water gives less than optimal results. For hard water situations contact a Davies representative and we’ll work to find you the perfect solution.